Happy Summer Solstice! Let's forget about this West Coast heatwave for a minute and talk about getting Conan O'Brien tickets. This has been one of the most in-demand SDCC events the last 2 years. As with many things SDCC, there's some confusion on how to get tickets and considerable disappointment when people fail to get in. 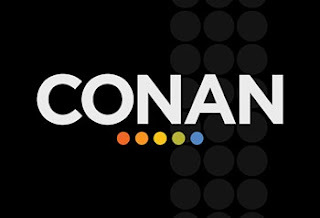 So I want to talk about what it's like to really go to a Conan O'Brien taping and how you can increase your chances of going. Conan O'Brien tapes his show at the Spreckels Theatre in San Diego during Comic-Con. A free Funko Pop is handed out to everyone who goes to the taping. During Comic-Con. Right now only Thursday, Friday and Saturday are listed on his site but we may get a Wednesday show, as we have before. We know 4 Pops are being handed out so presumably there will be 4 tapings. Tickets are free and theoretically available to all - but SDCC members have been prioritized in the past, receiving an email with a special code. How do you get that email? You need to make sure your Member ID account does not opt out of third-party emails. You should also sign up to get the Team Coco notification which is from the Conan O'Brien team. In the past, we haven't gotten much advance notice; you need to stalk your inbox and be ready to jump into action. Given this is unrealistic for most people with jobs/lives, the Conan sales are very much about luck. This sale is a bloodbath, as with everything SDCC, and even being quick on the draw isn't enough to necessarily get tickets. But it helps that in the past, we've been able to request tickets (maximum of 4) for every single day. When the sale goes live, you'll go to the site and try to get the date and number of tickets you want. Previously they've asked for your Member ID and the email promo code. However, some non-attendees have gotten tickets. This can be easier than actually scoring a ticket in the first place. Option 1: the time-honored SDCC tradition of trading. Maybe you have a Preview Night badge and can pick up an exclusive for someone in exchange for his Friday Conan tickets. Maybe he just wants you to give him the free Pop. Option 3: flying stand-by. This helps if you're in cosplay or otherwise visually vivid, because the producers want crazy-looking people up front to say "SEE HOW COMIC-CON WE ARE" to the viewers at home. But even if you just show up in streetwear, you have a good (not guaranteed) chance of getting in. Armed with your photo ID and e-ticket, you'll wake up at daybreak and hurry to Spreckels Theatre to get in line. Eventually after 8 the line will begin to move and everyone will get a wristband and paper ticket at the box office. At that point you're free to go. You'll head back up early to mid-afternoon, line up and eventually be let into the theatre. It'll all be done by 5-5:30; as you leave the theatre, you'll be swarmed by desperate-looking people whispering bids in your ear for your Conan Pop. Now, let's talk about if someone gives you a ticket. Unfortunately you can't just pass tickets around. My first year I had to go stand in line and then, when it started moving 2 hours later, text the person who actually had the ticket with his name on it. He and his friend came and took my place in line, got the wristbands, then deftly cut/taped them onto me and my friend at a hotel. Timeframes, if you're curious: Year 1, I got in line at 6 am and the line was already long. It began moving before 8:30; my friend had the wristband a little after 9. I got back in line around 2 and got into the theatre after about 45 minutes. That was the first year. Last year SDCC blogger Travis managed to get us VIP tickets so it was quite different. Overall, this is a time-consuming affair. It's not just popping in and out in the late afternoon, as I naively thought. And please know that the actual cast is on the stage for a very brief time. I'm not trying to dissuade you from going, but you do need to be prepared to sacrifice most of a day for this. If you have a Preview Night badge, consider choosing Wednesday so you won't miss any panels; just be ready to hotfoot it back to the convention center after the show. And if you're missing badges for Saturday or other days, obviously Conan is a great alternative. When buying tickets, you won't know which cast will appear on which day, though as we get closer it'll be easier to guess. You may not get your dream cast, but all of the guests will be good - so don't worry that it'll be a waste of a show. For now, keep your ears perked for more information - and create an 1iota account if you haven't already. Then be ready to swing into action. We're in Comic-Con season now and constant vigilance is the rule. It was nothing to do with that. He's just a smooth talker. This is accurate... I attended Conan in 2015 and it was a lot of waiting for little reward. I believe many attendees are only seeking the pops but the morning raffle has offered another option.